Craigslist is a popular website to buy and sell used items locally. If you’ve ever tried to declutter or buy a used item, you’ve likely used sites like Craigslist to do it. Craigslist is one of the best resources to sell your stuff online and locally because so many people use their free service. In fact, over 20 percent of U.S. based internet users visited the site in the past month, according to Statista. Regardless of the popularity of the site, many don’t like to use it. Or they want to list their items on as many platforms as possible. Fortunately, there are dozens of Craigslist alternatives and if you need to use a free classifieds site, this post shares the best websites like Craigslist to buy and sell used items. Before you use any service, it’s important to know how it works to ensure you know what to expect. Below are the ten best sites like Craigslist to buy and sell items locally and online. Facebook isn’t just a resource to keep up with your friends or waste time. Although most people think of Facebook as a social media platform, it’s one of the best Craigslist alternatives to buy or sell items locally. Like Craigslist, you can list or buy your items on Facebook Marketplace for free. You can even post your items in groups you’re a part of; just make sure the group allows it prior to posting. Once you list your item on Facebook Marketplace, you can share across your profile. If you want to buy an item from Marketplace, you can search for that item specifically or browse for categories in your area. For example, if you really want a motorcycle, you can search ‘motorcycle’ in the Marketplace. But if you need a car to get you from point A to point B and you need it for under $5,000, then you can use the car category and set up your budget. Oodle is an online marketplace that offers you a chance to buy and sell items locally. Founded in 2004 with QVC as their parent company, Oodle offers free classifieds like Craigslist. If you need to sell an item that’s harder to sell online (like a ticket to a baseball game), try selling on Oodle. You’ll also be able to find items that are harder to find on other sites, like event space or even baby hedgehogs. While the site is legit, do your research before meeting up with anyone or buying an item that should be checked out by a professional (like a car). And of course, don’t fall for the age-old scam of wiring money to anyone or vice versa. Don’t have a computer? No problem. You can use the Letgo app to list your items online. All you have to do to sell your items is sign up, take a picture of the item, and post it on the app. Similar to other websites like Craigslist, you can list anything you want for free. Letgo is also great if you’re looking to get rid of items, not just sell them. They have a “free stuff” section that you can use. This is great if you have items left over from a garage sale or if you want to declutter your house. Simply list them and let someone come and pick them up! As with Craigslist, you can only sell items locally on Letgo. But if you’re looking for Craigslist alternatives and want to list items for free, Letgo is a great option. OfferUp is different from other sites like Craigslist, as you can ship your items if you have a buyer willing to pay shipping costs. You can sell or buy items locally through the platform, but it’s nice to have the option to sell to people outside your city. You can list items for free, so there aren’t any hidden fees or costs associated with selling your items online. OfferUp claims you can list your items in 30 seconds or less. So if you’re selling multiple items, or if your listing items on multiple platforms, you won’t be wasting time trying to get everything on OfferUp. It’s easy and simple to use. Similar to Craigslist, you can buy or sell just about anything you can think of. Want to sell your car? Easy. Need some gently used shoes for your child’s soccer practice? Done. Geebo is one of the best, and the most truthful, sites like Craigslist that you’ll find on the internet. First, their safety priorities are top notch. For example, they personally review all submitted ads for signs of fraud or deception. That means you don’t have to be wary of scams or people who aren’t legit. While you won’t find ads for animals or firearms (as they’ve banned the option to list for both), you can find countless other things to buy. If you want a job, Geebo has an expansive jobs listing area. Geebo is not available in all areas. The platform only operates in the United States and is available in most larger cities. The Geebo site lists 100 different communities they service, so make sure to look for yours prior to listing items. Not a fan of Craigslist? You can try Close5 as an alternative. It works similarly in the sense that you can buy and sell locally, but it’s backed by eBay, so you can even offer shipping if you’re selling an item. With over 130,000 active users, you’re bound to find items to buy and you can sell your stuff easily. With Close5, you can also list items for free, unlike with eBay. Close5 is only available via app, but is available on iPhones and Android phones. The app has features like profile sign-in and in-app messaging to keep contact information private. No more texting people like crazy or giving strangers your personal information! Live outside of the United States? With Locanto, that’s not a problem. With over 60 countries available, you’re likely going to find what you’re looking for in whatever area you’re in. It’s easy to place an ad on Locanto. Unlike the other sites like Craigslist, you can list an item plus add a link to your website or another shopping page along with products photos. Another great perk with Locanto is you can modify your search. You can choose what you want to buy, put in your location, and set parameters for how far you want to travel. And you can sort by price. Along with selling and buying stuff, you can find job postings, services, and even classes or tickets to events in your local community. Gumtree is a Craigslist alternative that lets you buy and sell items all over the world. It is available in the UK, Australia, South Africa, and Singapore. To sell or buy on Gumtree, you’ll need an account. You create one using either Facebook or a Gmail account. If you plan on selling items, you can choose to list your items for free or pay to have them “featured” as a top listing. To sell an item as a sponsored ad, it needs to be new or refurbished, so keep that in mind. If you plan on buying items, you can search for what you need. If you still want the item, you can easily message the seller and clarify payment options as well as set a time to meet and pick up the item. If you’d rather call the seller, GumTree offers the option to find the seller’s number. You can also send in offers by using the “Make an Offer” field. If your offer is accepted by the seller, you’ll be notified in the app. That’s correct, you can use USA Today to sell your used or new items. Both the online and print versions of the newspaper offer free classifieds like Craigslist to buy and sell items. The USA Today classifieds section is best if you want to sell a big-ticket item. The site receives over 97 million unique visitors per month, according to their website, so you know your items will get in front of a lot of eyes. City News allows you to list items for free, but you can pay for upgraded ads to get in front of more people. City News lets you sell traditional items like collectibles and cars, and you can also list items like astrology and medical services. There are many sites like Craigslist that you can use to buy and sell your stuff online and locally. While these sites all have something to offer, you can test them all (for free) to see which site you prefer and which gives you the best opportunity. Take care and do your best to avoid scams, and practice safety when meeting individuals to exchange items. It’s best to deal with cash only and not give away personal financial information. Whether you’re in the United States, or around the world, you’re bound to find a site that can help you get rid of items or buy what you need. What are some other sites like Craigslist you’ve used to buy and sell items? How often do you declutter your house and get rid of unwanted items? What tips do you follow to sell your stuff? 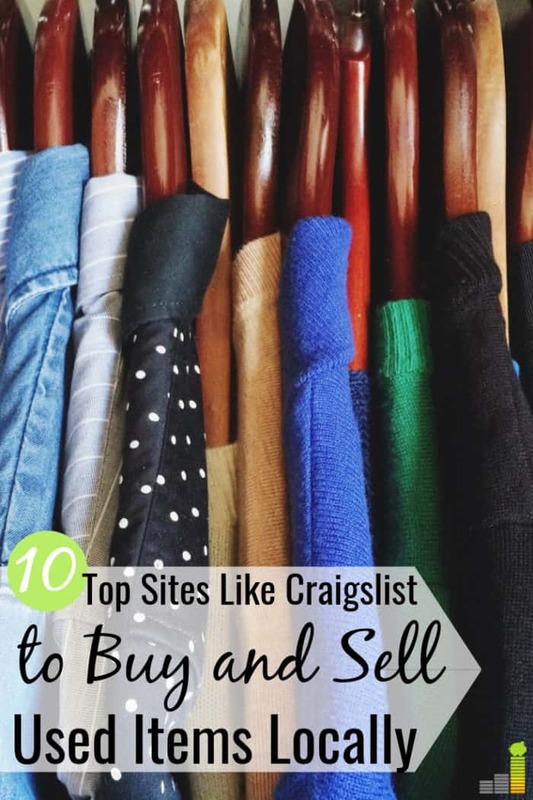 The post 10 Best Sites Like Craigslist to Buy and Sell Your Stuff appeared first on Frugal Rules.